NattoMax® is concentrated without solvents. Each capsule offers 2000 Fibrinolytic Units. 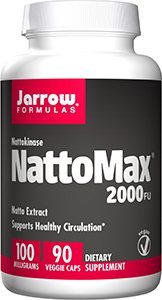 Nattokinase is a fibrinolytic enzyme that supports healthy circulation by its effects on serine protease-mediated digestion of fibrin to dissolve blood clots. A study was performed to examine the effects of nattokinase supplementation on blood pressure in subjects with pre-hypertension or stage 1 hypertension. In a randomized, double-blind, placebo-controlled trial, 86 participants ranging from 20 to 80 years of age with an initial untreated systolic blood pressure (SBP) of 130 to 159 mmHg received nattokinase (2,000 FU/capsule) or a placebo capsule for 8 weeks. Seventy-three subjects completed the protocol. Compared with the control group, the net changes in SBP and diastolic blood pressure (DBP) were -5.55 mmHg (95% confidence interval [CI], -10.5 to -0.57 mmHg; p<0.05) and -2.84 mmHg (CI, -5.33 to -0.33 mmHg; p<0.05), respectively, after the 8-week intervention. The corresponding net change in renin activity was -1.17 ng/mL/h for the nattokinase group compared with the control group (p<0.05). In conclusion, nattokinase supplementation resulted in a reduction in SBP and DBP. These findings suggest that increased intake of nattokinase may play an important role in preventing and treating hypertension.